For breakfast, Spencer pulled out some salami to make a delicious egg and potato dish, spicy southern style grits. Then by 2pm we had the fishing line zinging … fish on! When I grabbed the rod and felt the line unspooling fast, I knew this fish was powerful. Spencer brought down the headsail to slow down the boat, and steered to keep the fish from snagging the underside of the boat. After a solid fight, I got him alongside Aldebaran and Sabrina landed him with the net. We were dazzled by his shimmering blue and silver colors, speckled with black. This was a magical sea creature whose colors dance in the sun’s rays. We gave him a prayer for his life and deep thanks for the gift. Wow… this blue fin tuna was quite heavy for his size, I’m guessing 14lbs, which yielded enough meat for the four crew to enjoy four meals. Each meal has since been extraordinary. Marinated tuna with mango-almond cabbage salad. Seared ahi with beets, rice and beans. Fish cakes on a caper sauce. For two days now we’ve kept the fishing lines resting. We are enjoying this remarkable blessing from the ocean. Huge kudos to Sabby’s Cami feathered lure, which has been producing, and helping us eat like kings and queens in mid-ocean. It lost a few feathers to this magnificent fish, which Sabby pledges to make an earring out of…! Beautiful starry night, breeze steady at 10-12kts. Nice on the bluefin! 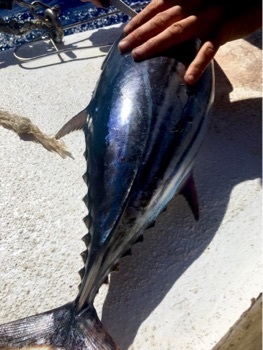 Glad the fishing gear is getting good use and the crew is starting to find some of the more delectable tunas. Thanks MC!! You left big shoes to fill… i’ve been studying Scotty’s book and it’s paying off! You would have been rocking your TUNA shirt in honor. In fact, I still think of that day when you pulled that shirt out of your bag, a glorious moment seared in my memory. Miss you brotha!